As a young boy, George Gurdjieff was exposed to traces of this prior and earlier version of God’s sacred text that Swedenborg claimed was in the possession of a more remote human civilization. In Gurdjieff’s book Meetings With Remarkable Men he describes how his father, who came from a long line of bards (singer/storytellers) would recite ancient legends and begin discussions as to their possible extra meaning that lay hidden deep within their literal words. Gurdjieff describes one such event when his father sang to him the legend of the Babylonian hero Gilgamesh. Gurdjieff said that the twenty-first song of this legend eventually became engraved on his memory. They resolved to flood the land of Shuruppak. Gurdjieff’s father, who was taught this tale from generations and generations of storytellers before him, suggested that the legend of Gilgamesh came from the Sumerians, a people more ancient than the Babylonians. Furthermore, he believed that this legend was the origin of the account of the Flood story in the Hebrew Bible. The young Gurdjieff later came across a magazine article describing an archeological dig in Babylon that uncovered tablets over four thousand years old. 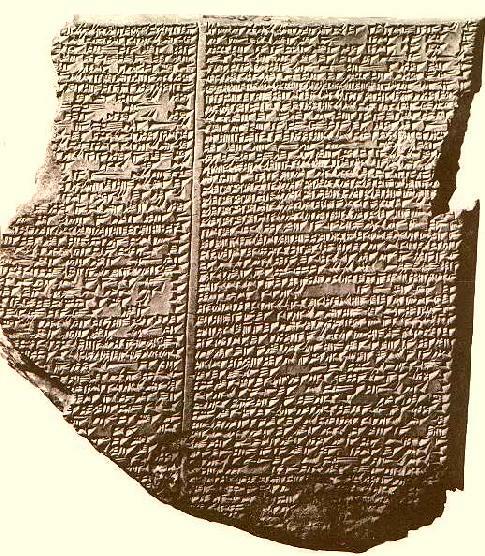 The magazine article published the deciphered text of the tablets—it was the legend of Gilgamesh! Gurdjieff, was shocked that the exact same story on the tablets had been told to him, by his father, who had received this story from an even more ancient oral tradition. While you might think that the Gilgamesh story and the biblical story of Noah indeed have some similarities you might recoil at the idea that the one was the origin of the other. But Gurdjieff’s father (as well as Swedenborg) would stress that it was the hidden or symbolic message that was transferred from one account to the other. It was this deeper sense of meaning that made these stories sacred and holy. Swedenborg claimed that the Ancient Word consisted of a symbolic language that was more remote from the symbolic language of the Hebrew and Christian Bible but that the hidden communication and message was still the same—a communication from God’s infinite depth to serve as a guide for the spiritual growth of the human race. How awful it is that the post-modern world and its secular trajectory of “reasoned thought” views Holy Scripture as a non-relevant document chock full of silly and insane scenarios. Sorry, but many of today’s intellectual elite do not have the cognitive powers of simple bards to distill higher meaning. This entry was posted in god, Inner growth, Reality, religion, spirituality, symbolism, unity and tagged Ancient Word, Bible, Emanuel Swedenborg, George Gurdjieff, Gilgamesh, higher meaning, legends, Noah’s Flood, Sumerians. Bookmark the permalink. Howdy!!!!!! How’s everybody in the Sylvia World? I just turned on a fellow student to your blog. She’s Dagmar and loves Swedenborg’s Writings but also is intent on the scientific focus, so I told her about your website. Yes, I’m in seminary myself, who would’ve guessed, and online with both SSR and a quaker seminary that accepts the combination of both, am intent to become a chaplain someday when I grow up…..peace, send important stuff, say cheers to Sue, and tell me when you’ll be at church so we can hook up!!! Becky The Most Ancient Church was on the Celestial level, but the New Church revelation makes the Celestial different, doesn’t it? Good to hear from you! Congrats on going to seminary! My “ministry” is not tied to a bricks and mortar church but reaches all those who read my blog and books. It seems that the celestial level of heaven from those who were of the Most Ancient Church is different from that of the New Church. We are of a different genus and therefore our heavenly societies are kept separate. But as in Swedenborg’s case, I suspect the Lord would allow some of us to visit that society in the other world if it would serve some special use! Let me know when you can get to the church and Sue and I will just plan to show up!